In the 22 years I’ve been a city resident I can honestly say I’ve never seen the moat around the Fort so filled up with water. People have been sending me photos of canoes being paddled around downtown and Arredondo in Davis Shores and many homes became waterfront this past weekend, however temporarily. Roofers will be in short supply for the next few weeks and the rest of us will be busy picking up all the twiglets that fell from the tree canopy. Hope everyone came through with not too much aggravation and that Mother Nature will smile favorably on our local merchants as the upcoming weekend looms. By all accounts there wasn’t an empty seat at the St Augustine Amphitheatre when Bob Dylan took the stage this past Sunday evening. A recurring theme reported amongst the concertgoers was how amazing it was that Dylan was actually here in St Augustine! Indeed! Thanks to the all the folks who donned their raingear and came out to support the musicians performing at the Gamble Rogers Folk Festival this past weekend. Attention residents of the Flagler Model Land Company Neighborhood Association: this Monday, March 13 is the spring quarterly meeting and there’s a very special guest speaker. Mark your calendar for 7pm when David Nolan will present “A 450th Worth Celebrating.” If you’ve never heard David speak, prepare yourself for a genuine treat. If you’re already a lifelong fan as I am, make sure to get there early to get a good seat. The Neighborhood Association is also sponsoring a book drive for the St Paul’s School of Excellence in cooperation with the neighborhood Ketterlinus Elementary School . There are all kinds of exciting things happening so as a resident you need to get yourself down to the meeting and participate. It‘s Romanza week from May 10-19 and you know what that means – it means get ready for a cornucopia of art, music, food and wine and then some! 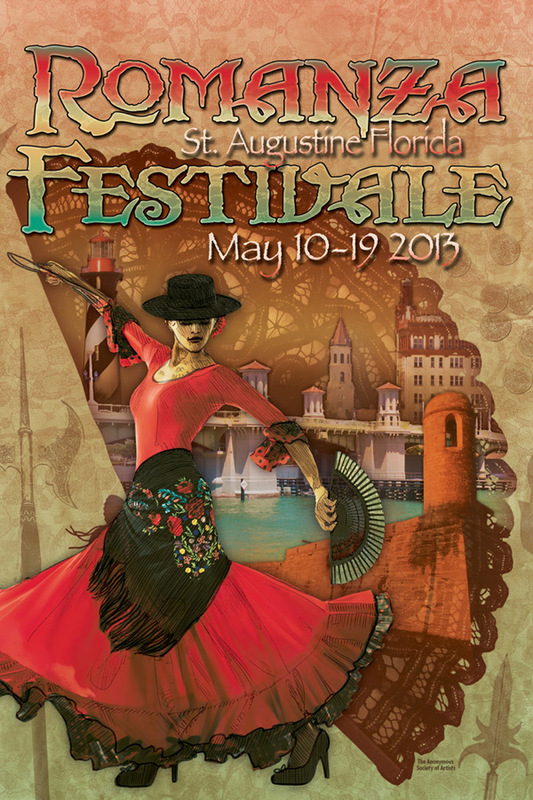 Over 80 shows in 10 consecutive days include the Ponce de Leon parade, the St Augustine Community Chorus performing Mozart’s Requiem and Haydn’s Te Deum, A Gilbert & Sullivan Evening with the North Florida Women’s Chorale, re-enactments , lectures, workshops and food, food, food, to name just a few things to put on your to do list. 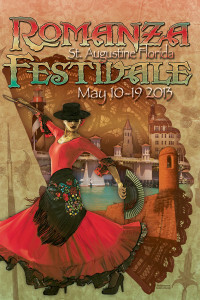 Check out RomanzaFestivale.com for all the information you need to enjoy every bit of this wonderful event. A big bravo to all the people who give their all to put this together! This Saturday is the US Postal Service Food Drive and everyone is encouraged to leave a non-perishable food item (canned or packaged) by their front door. If we can all do this we can make a dent in stamping out hunger at home as all the food collected stays here in St Johns County. Please be generous if you can and write yourself a note so you don’t forget. Elyse Brady from the St Augustine Art Association invites everyone to four art exhibitions, a Colonial harp concert and an arts award reception combined to make a special Romanza Mother’s Day event this Sunday at 3pm. Mary Jane Ballou and friends will celebrate 250 years of Colonial music and if you’ve never heard Mary Jane on the harp, you have not truly lived. A preview of more than 200 works from the Ancient City 450th Mosaic will be on display as well as stained glass windows created by national artists from the American Glass Guild. The St Augustine Art Association is located at 22 Marine Street and you can get more info at staaa.org. If you’re a fan of KYV Farms which supplies the excellent foodstuffs you find in the dishes served at The Floridian and at the Sunday Lincolnville Farmer’s Market, you’ll want to check out their pig roast planned for May 19. Being held near the Old Bartram Trail on the banks of the St Johns River, KYV Farm is the region’s only certified organic farm. No farmers, no food – important to remember. For tickets and info go to slowfoodfirstcoast.com. This event is part of a series called Slow Food Sunday Suppers organized by Slow Food First Coast and Richard Villadoniga is happy to tell you more if you email him at rvilladoniga@yahoo.com. That’s it for now. See you on the street and as always, keep me posted on your doings.